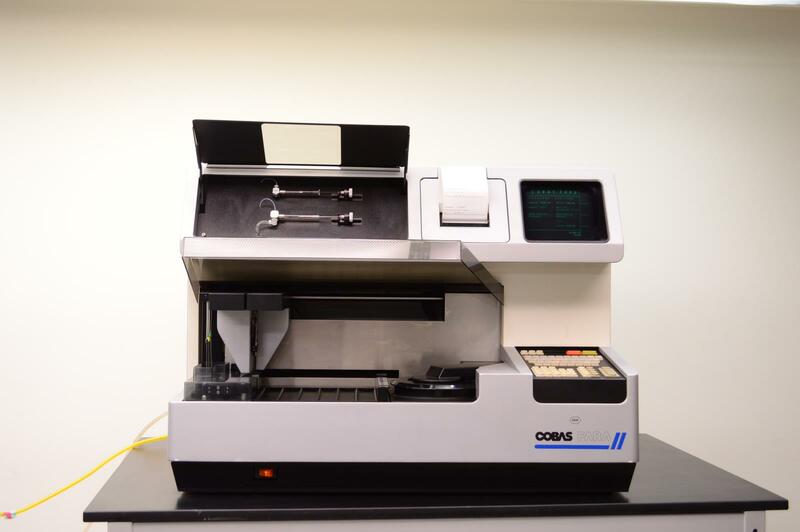 Roche Cobas Fara II Centrifugal Automated Chemistry Analyzer . New Life Scientific, Inc. This instrument is in good working order overall, but there are a few issues we have not been able to resolve. On power-up the instrument initializes and the printer reports "SYSTEM INITIALIZED" then after 5 minutes, the printer reports "1 ROM CHECK FAILED" but everything appears to be operational. The "prime" and most other operations run without issue, but when "FP CHECK" is run, the rotor spins making a bit of a whine, then screen reports "ROTOR CHECK FAILURE". We were able to get past this once after some adjustment to the rotor, but have not been able to repeat that success. We believe it is a calibration issue and the instrument will need to be recalibrated/tweaked a bit. Someone with just a little expertise on these systems could turn this into a great unit. Please see the pictures for more details. Please contact us if you have any questions regarding this item or if you would like us to send more pictures of it. Additionally, we are willing to perform whatever tests or examinations you may request in order to better determine the condition of the unit. Simply contact us with detailed instructions. Good condition, but with minor issues that need fixed - initializes to "ready".